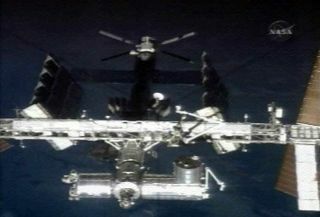 This still image from a video camera outside the shuttle Discovery captures the space station and its new Kibo lab (right with attic and robotic arm) after undocking on June 11, 2008 during NASA's STS-124 mission. This report was updated at 6:01 p.m. EDT. HOUSTON — NASA?sshuttle Discovery and its seven-astronaut crew said ?sayonara? to the InternationalSpace Station (ISS) Wednesday to begin the trip home after delivering a newJapanese lab to the orbiting outpost. Discoveryundocked from the space station at 7:42 a.m. EDT (1142 GMT) after nine days of orbitalconstruction to install and outfit Japan?sbillion-dollar Kibo laboratory. ?We wish them the best with their expedition and we hope we left them abetter, more capable space station than when we arrived,? Kelly said of thestation?s three-man crew, saying goodbye after delivering Japan?s Kibo lab. ?Sayonara.? Discoverycast off from the station as the two spacecraft flew 214 miles (344 km) abovethe southern Pacific Ocean, just east of Australia. The spacecraft is due toland Saturday with Kelly, shuttle pilot Ken Ham and mission specialists KarenNyberg, Ronald Garan, Michael Fossum, Japanese astronaut Akihiko Hoshide andreturning station crew member Garrett Reisman of NASA. Reisman isreturning to Earth after three months in space after turning his flightengineer reins over U.S. astronaut Gregory Chamitoff, who launched aboardDiscovery May 31 and remained aboard the station today with two Russian crewmates. ?It was agreat adventure with all of you, an adventure of a lifetime,? said Chamitoff,who is beginning a six-month mission at the station. ?We wish you guys aterrific flight back, an awesome landing and look forward to seeing you on theground.? Reismantold the station crew to feel free to dig into the stash of Snickers candy barshe left behind, but was apparently too late. ?We foundthose last night and have already broken into them,? Chamitoff said. Duringtheir nine days at the space station, Discovery installedJapan?s Kibo lab, added a storage room to the rooftop of the 37-foot(11-meter) module and test drove the massive room?s new robotic arm. Threespacewalks were performed during the mission. ?Thismission has gone just phenomenally well so far,? said Matt Abbott, NASA?s leadshuttle flight director for Discovery?s flight, during a Tuesday briefing hereat the Johnson Space Center. Built bythe Japan Aerospace Exploration Agency (JAXA), the Kibo lab is the largest roomaboard the space station and leaves the orbiting outpost about 71 percentcomplete, NASA officials said. ?It has two windows and its own small airlock toprovide access to an external experiment platform that is slated to launchaboard a NASA shuttle next year. Astronautsdelivered Kibo?ssmall storage room earlier this year during a March shuttle flight. Asmaller robotic arm, which will allow Kibo?s main 33-foot (10-meter) limb tomanipulate experiments on the external platform, is also slated to fly nextyear. ?I?mlooking at the next chance for our science work,? said JAXA?s deputy Kibooperations manager Tetsuro Yokoyama, adding that first experiments aboard thenew lab are expected to begin in August. Before departingthe station, shuttle pilot Ken Ham took the helm of Discovery to guide itthrough a victory lap of sorts around the orbiting lab while his crewmatessnapped photographs of its exterior. Known as a fly-around,the maneuver allows astronauts to document changes in the station?s appearancewhile giving shuttle pilots a change to fly their spacecraft. ?This is a greattradition that started somewhere back in the early days of rendezvous-typemissions with the space shuttle,? Ham told reporters before flight. ?Andwhoever thought of it was brilliant.? Discovery?s crew also conducted a five-hour inspection of the heat shieldpanels along their shuttle?s wing edges and nose cap. The inspections are nowstandard since heat shield damage led to the loss of the shuttle Columbia andits astronaut crew in 2003. Discoverylaunched without its own laser-tipped boom for heat shield inspections justafter liftoff and before landing because Japan?s massive Kibo lab took up toomuch room in cargo bay. Instead, astronauts retrieved an inspection boom left atthe station during a preview shuttle mission. Abbott saidthat a cursory inspection of Discovery using the limited reach of its ownrobotic arm, as well as photographs of its heat shield taken before docking,have shown no areas of concern for engineers back on Earth. Today?sscan will provide a better view of the underside of Discovery?s wing edges, withengineers hoping to complete their analysis some time tomorrow, Abbottsaid. Meanwhile,Discovery?s crew is on track for its planned Saturday landing at NASA?s KennedySpace Center in Cape Canaveral, Fla.
MissionControl here roused the astronauts early Wednesday with the song ?Centerfield?by John Fogerty, a tune selected for Ham by his wife Michelle. ?Girl, youare my home, and all of us are going to start our journey home today,? Ham toldhis wife via Mission Control as the shuttle and space station zipped around theplanet at 17,500 mph (28,163 kph). ?From my rough calculations, that?s about amillion miles, but we?re going really fast so we?re on our way.? NASA isbroadcasting the Discovery's STS-124 mission live on NASA TVon Saturday. Click here forSPACE.com's shuttle mission updates and NASA TV feed.